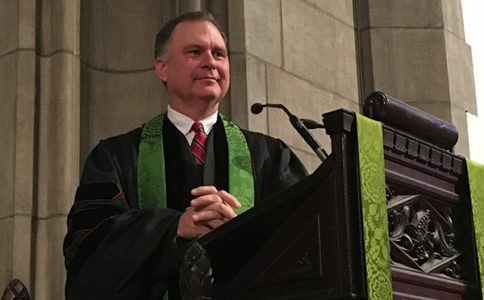 Martin, a graduate of the University of Northern Iowa and Princeton Theological Seminary, has served three other churches prior to being called to FPC Greensburg in February of 2001. A native of Iowa, Martin met and married Julie Winneur in Michigan in 1993. Julie received her Ph.D. from the University of Pittsburgh and is currently an Associate Professor in the Education Dept. of Indiana University of Pennsylvania. Martin graduated with his Doctor of Ministry degree in May 2016 from the University of Dubuque Theological Seminary in Iowa. Their daughter, Hadley, is currently enrolled in college in New York City. Martin, Julie, their daughter, and one mangy dog complete their family.